Today is day one of the Major League Baseball first year player draft. The draft, which is ceremoniously held in MLB Network’s Studio 42 (the one that looks like a baseball field) every year, is a most interesting time for teams, who have meticulously planned out their future seasons from some of the scouting and legwork, all leading up to this draft. The Mets alone have drafted David Wright, Ike Davis, Matt Harvey and Michael Conforto, among others, in the first year draft since the turn of the century. There has also been a fair share of duds in the first year player draft, like flamethrower Bradley Holt, Nathan Vineyard and Eddie Kunz. It’s safe to say, like in the game of baseball itself, you win some, and you lose some. Basically, the MLB Draft is a strategic coin flip. And that’s the story. Don’t get me wrong, I think the draft is important, and I respect writers and fans that get really into it, but the implications of the Draft itself are not as important as the development of the player itself, unlike the draft in some other sports, where a player spends minimal time in minor leagues. Mets Hire Two New Public Address Announcers; One Female! This is very, very interesting news from the Mets. After Alex Anthony (the longest tenured Mets PA Announcer, from 2003 until 2017) firing at the beginning of the year, it was PA Announcer Rob Rush who took over the helm as the voice of the stadium. Rob’s voice was very similar to that of Anthony, and he had a similar style of voice. I had assumed that Rob would just slide in as the replacement, (he was previously the back-up) but he has now been reassigned, to make way for two brand new public address announcers, that will debut during this weekend’s Mets versus Cubs series. The New York Mets today announced Marysol Castro and Colin Cosell as public address announcers for the 2018 season. Castro and Cosell will split duties for the team with Castro making her Citi Field debut tomorrow night and Cosell on Saturday night. Castro will become the Mets’ first female public address announcer. She has spent the last two decades as a television journalist and host. Castro has previously worked at WPIX-TV, News 12 The Bronx and served as the weather anchor on Good Morning America for seven years. She has also anchored weather at CBS’s The Early Show and spent two years as a host and sideline reporter for ESPN. Castro attended the Columbia University Graduate School of Journalism in New York City and Wesleyan University in Middletown, Conn.
First off, I think it’s absolutely phenomenal that the Mets are letting a female do the PA duties, and Cosell seems like a good fit as well; that being said, I’m curious to see how they are going to break up the time. It’s already a part-time gig, so breaking it up seems like an odd choice. Also, was anything wrong with Rob Rush? I knew he was the interim to start, but is it really necessary to hire two new voices? I guess we will see this weekend…..
Best Case Scenario, Where Does David Wright wind-up? Picture this: The Mets have signed Frazier, and plan for him to be in the hot corner for the next two years. David Wright, who now no longer has the pressure of being the everyday third baseman, performs well in Spring Training, and is healthy enough to start the year with the Mets. Not only that, he gets off to a hot start. Sure, there is a lot, and I mean A LOT of wishful thinking here. The chances of Wright being ready to break camp with the Mets is probably less than 15%, and the chances of him preforming well are even less. That being said, this is Baseball, and David Wright is still the captain, so what would you do? Surely a captain with a resume as big as David Wright’s wouldn’t rot on the bench if he deserved playing time, would he? Well, there is a precedent to this. You may remember Jason Vartiek, a life-long Red Sox catcher, and the last ever captain to wear a “C” on his chest. Varitek, like Wright, was beloved by home town fans, and, after the Red Sox went out and signed Victor Martinez in 2010, and Jarrod Saltalamacchia in 2011, Varitek stayed aboard as the backup, guiding the pitching staff with his words of wisdom, and when his contract was up, he announced his retirement. Now, will David Wright stay with the Mets for another four years? Probably not, but it isn’t a crazy idea for him to be that clubhouse leader, or player/manager type guy. Of course, a clubhouse leader is not worth 20 million, but if he is determined to stick around, I firmly believe he will always have a place on the Mets roster. Two Days in the Show, and Rosario has a Topps NOW Card! That didn’t take very long. Two days into his big league career, and Amed Rosario has his first (hopefully of many) Topps NOW Cards. ThE card, which one can purchase HERE, commemorates the occasion of Rosario’s first big-league hit, and is only available now through Thursday at 3 p.m. ET. Only the number ordered through that time will ever be created. I’m going to pick one up, and maybe do some other Rosario shopping while I’m at it…. How many Mets Blogs are out there? Yesterday, I read an interesting column on the history of print and web based journalism, and how written mediums are quickly getting replaced by multi-media tactics. I knew this was prevalent in our society, but it’s becoming increasingly more clear nowadays when top-tier writers like Ken Rosenthal are linking to their Facebook to express their opinion. However, the most shocking moment for me was when Matthew Cerrone, the king of Mets Blogs, talked about sharing and interlining content with other blogs during his book signing. He explained that he doesn’t do that nearly as much because “There aren’t many left”. Those words echoed to the back of the Barnes & Noble, and reverberated off the skulls of the blogger in me, now curious, unsure if my pursuit of become a more regular writer is something that won’t be available for me in 10-20 years, when I’m older. It was a perfect bit of dialogue that captures how the media world is changing day by day. What used to be expressed in a 100 word blog post can now be just as easily described in a 100 character tweet, but it wasn’t always this way, oh no. When I was younger, I remember just how many Mets sites were out there, so many, that I thought (and still do) that the Mets have the most passionate and well-educated fans anywhere in the league. There were so many, that Mets360, made a comprehensive list of all the Mets related sites out there. He came up with over 25 and listed even more that were once considerably active that still share some Mets information. However, the times have changed a lot since then, some new blogs popped up, and some older blogs disappeared, so I wanted to start a list to see how many Mets Blogs exist actively that share Mets information. To qualify, I think a blog should at least have written five posts in the year 2017 and one post in the last 3 months, additionally 50% of the content be related to something Orange & Blue. That’s it. So here is the list, feel free to add to it if you’d like by commenting below or tweeting @NikoMetsPlus. I’m actually curious to find the exact number of active sites left. Simply put, I’m amazed. There are just about 25 sites that are active (most of which were started in the Shea Stadium days) and there are plenty more that I probably couldn’t find on my own. While I’m pretty active on the Mets online-sphere, I didn’t know of a good chunk of these blogs until I composed this list. It’s awesome to see how many websites share different types of information, and not just the lineups and recaps. Articles on unique baseball cards, the bullpen cart, uniform alterations, their podcasts, unique interviews, and all the other stuff one can’t get from a quick social media post is what makes the Mets blog network stronger than ever. It’ll be interesting to see this list evolve over the coming years; and if there are any blogs left out, again, feel free to comment or tweet me, so I can add it. This list should be a place where one can discover new Mets sites and connect and network with their authors. This is absurdity at it’s best. Shannon Shark of MetsPolice.com, shared this New York Times article that came out yesterday over the state of protective netting at New York stadiums. In brief, the article talks about how Terry Collins and Jay Bruce support their employers decision (shocker), and how the Yankees have balked at the idea, as even preliminary discussions have prompted Yankees fans to write in and complain. As significant a move as the Mets have made with the additional screens, it does not meet what City Councilman Rafael Espinal is asking for in a bill that would require both the Mets and Yankees to extend protective netting all the way to each foul pole. Now, we should all remember that there are hundreds of bills that are proposed every year that never come to surface, but the idea of netting extending to the foul poles is so preposterous. Even the folks that support protective netting, who say that there are little kids and the elderly that do not have a quick reaction time, I’m curious, why not sit in the 25 sections along the field level that now have netting? And, also, who’s reaction time is so slow that they can’t get out of the way of a ball that travels 330 feet? I’ve never been in support in any additional netting, and while, sure, I feel terrible for the occasional child that isn’t paying attention in the first row, this overkill is 100% linked to the increase in distractions prevalent in modern ballparks and advances in modern technology. Don’t get me wrong, I check my Twitter feed and email several times during a game, but when I sat in a box seat behind the dugout, I was locked in to the action when the game was being played. And, if, you do want to be casual at the game and go for the experience instead of the game (which is fine, in my opinion) that’s what outfield seats, the Excelsior and Promenade levels, and seats behind home plate are for. Even before the netting, over 80% of the ballpark seats were safe from ballpark netting, and those 15-20% behind the dugouts were subjecting themselves, which has always been prominently displayed as a disclaimer on Mets.com when purchasing those tickets. When I used to go to Shea Stadium as a kid in those famous orange box seats, I remember the usher telling us that we should pay attention, as the ball comes fast, and that we might have a chance to get a ball. And, you know what? I payed attention, and I loved the game of baseball from that moment on. Last week, I sat in similar seats when the Rockies were in town, and I felt totally distanced from the game, like I wasn’t a part of the action. I could reach out and grab a ball, and while that’s not important for me, I’m sure the younger kids in attendance, who will be adult Mets fans in no time, might not have the same connection with the game as my generation did when I grew up. So, Councilman Espinal, I understand your concerns for safety, but at some point there has to be a line. Sure, safety is paramount, but we don’t go to the game to be safe, we go to have fun, root on your team, eat ballpark fare, play games, be with the family etc. People that care about safety have options readily in place. This isn’t an airport or an automobile, this is a ballpark. The Mets are heading into Texas to play a two game series with the Rangers, and for the first time in a while, I actually enjoyed Monday’s off day. Call me crazy, but there was something enjoyable about not watching four hours of disappointment and realization that this team that was destined to get to the World Series is a 24-31 team with a 15% chance at a Wild Card. Sure, not every team that is built to win pulls through, but in the two short months of the Major League Baseball season, one can’t help but feel the lifeless atmosphere that surrounds this team. There is little chemistry, anything that can go wrong seemingly is going wrong, and despite the upcoming remedies in Seth Lugo and Steven Matz for the rotation, and Yoenis Cespedes in the lineup, there is this odd feeling that’s being emitted from the ballclub that none of these players will be the solution. And in early June, two weeks away from my high school graduation, my greatest fear is creeping closer and closer, one that hasn’t prevailed since 2009, which, in all of it’s simple glory, is boredom. Joel Sherman of the New York Post called the Mets “suckers”, talk radio is ripping the team to shreds, and frankly, I don’t want to listen to all of the negativity. Unfortunately, one of the key obligations of being a true fan is listening to it. I have to be there at Citi Field watching Neil Ramirez give up run after run, but the passion is being drained. When watching the game changes from the enjoyable part of the day to an obligation simply because you’re a fan, the passion thins out considerably. And, I’m not saying bad baseball is always un-enjoyable. Every Met team from 2010-2014 finished in the bottom of the NL East but the storylines and likability of the players and the idea that the players are devoted to making things better made you want to stick around and commit to the players in return. The 2017 Mets, at least so far, have not evoked a similar reaction to me. Every story line is depressing, players are putting themselves before the team, and there is a lack of leadership that is so evident. So, sure, promote Amed Rosario, promote Dominic Smith and add the injured reinforcements, but unless something major changes to create a new culture, fans are going to change the channel real quick, if they haven’t already. Hurry up, Mets, the sun is setting fast. One of the most popular questions I get on a daily basis from Mets fans is what to do at Citi Field. While most fans live in New York, a lot of fans live outside of the Metropolitan area or simply do not have the time or the means to visit. So, I decided I would write a small post, a beginner’s guide of sorts, with some brief history, facts & figures, and my personal opinion on the stadium that is turning eight years old this April. The first thing I will say about Citi Field is how every fan has a different opinion on the stadium. Some fans hate the stadium, citing a plethora of Dodgers references, and some fans love the stadium, stating that it’s family friendly activities make it a great experience for a Sunday afternoon. This is a trend among stadiums in the 2000s, starting with Oriole Park in Camden Yards, is the movement of “Retro Modern” stadiums, something Citi Field follows to a tee, where a stadium will look rustic and display heritage on the outside, but look pristine on the inside with all of the modern amenities. Like the title suggests, this rotunda, designed by POPULOUS (or HOK Sport like many call it), is designed after the history of the Brooklyn Dodgers. Some of Jackie Robinson’s best quotes and pictures are adorned inside a replica of the Dodgers fifth and most popular stadium, Ebbits Field. So why is this entrance criticized so heavily? Well, Citi Field is the home of the Mets, not the Dodgers. When you walk into Citi Field, a lot of Mets fans would have preferred statues of Tom Seaver and Keith Hernandez, even the press has written about it at length. And while the Mets haven’t added statues yet, they did listen in 2010, when, one year after the ballpark’s first game, they opened a “Mets Hall of Fame and Museum” with commemorative plaques, jerseys and even the World Series trophy. 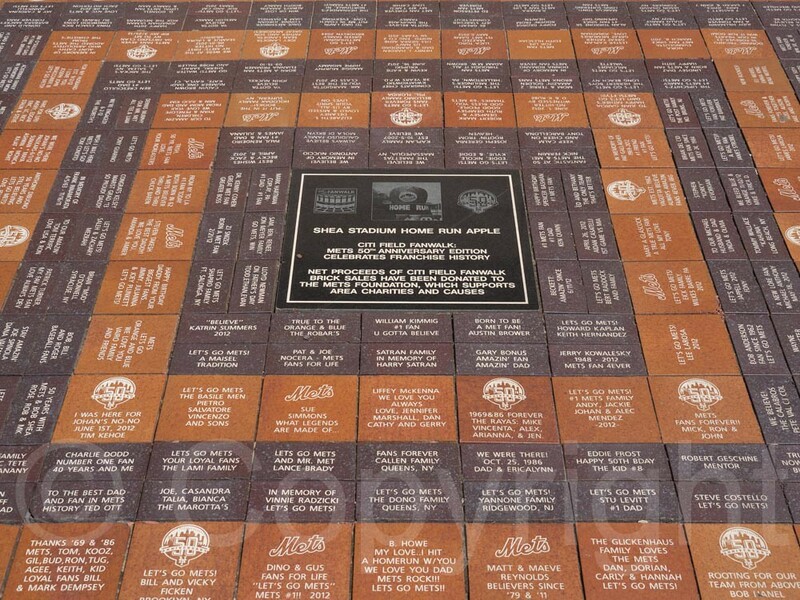 Another tactic the Mets have done to try to make the outside more Mets centric is the addition of fanwalk bricks, which is very cool to see in practice, as I’d much rather see quotes from Mets fans than Geico advertisements, but is very costly for the fan. Moving inside the stadium, we see another new ballpark trend. Team Stores. Two, to be exact, less than 50 steps from the entrance. This no-frills tactic, where you don’t pay much on a ticket, but are forced to pay a lot for merchandise and concessions is a truly brilliant move. If you are a fan that wants to watch the game and nothing else, you can buy a ticket for $6 dollars, and enjoy the game. If you want to have fun with your family, you can enjoy all of the concessions and fun games at Fan Fest (currently called Send In The Clowns Fan Fest, but that always changes….) like dunk tank, a fast pitch game and event virtual simulator. Additionally, young fans can run the bases after Sunday Home Games (known as the Mr.Met Dash), which is extremely fun for the little ones, and is another example of how teams are becoming more accessible and interested in “opening up” their stadium. Ten or twenty years ago, when ballparks were considered “sacred” a post game dash would never be allowed. Another ballpark staple is food, and Citi Field doesn’t disappoint there. The New York Post and other newspapers have often called Citi Field the best stadium in the world as far as eats, and I don’t disagree. Last summer, MLB sent me to Citi Field to do a “Culinary Citi” feature. (Well, two actually…. I like ballpark food) And, I completely understand why people feel this way. While the food at Pat La Frieda’s looks good, I kind of question the idea of an indoor steakhouse at a Baseball field, but, I digress. The actual baseball field has evolved as well (and yes, it’s very ironic that we have made it so far in a ballpark review without actually talking about the field), in 2009 the left field wall and parts of the right field walls was 16 feet high, which is double the size of a standard fence, eight feet high. Another criticism in the wall was the color of the wall. The above picture was taken in 2009. The black wall, a reversal from the Blue wall from the Mets previous home, Shea Stadium, was met with a lot of condemnation. In fact, the only similarity between the fields were the orange flag poles, something unique to the Mets. Because of that, the Mets have changed the dimensions of Citi Field three times, in 2010, 2012 and in 2015. Today, the wall is Blue, and has two interesting areas in the space between the old fences and the new fences, both of which offer un-parralled views of the stadium, come with free food and drinks, and come with a hefty price tag. Another thing that Citi Field improved on with the new fences was their capacity, which is technically 41,922, but is actually over 42,000 when you consider club level seating. The record attendance was the sole All-Star Game that the Mets hosted in 2013. In that mid-summer classic, 45,186 went through the turnstiles, which included a lot of standing room tickets, something the ballpark was meant to include. These boards feature all of the statistics one could ever want, from batting average to WAR+, and yes, that is a baseball term. Off the field, Citi Field hosts a lot of events through their Metropolitan Hospitality Division. A corporation that is owned by the Mets, and one that I’ve had the privilege of collaborating with in the past. Some of these events include Tours, the Bacon + Beer Classic, The Color Run, various concerts and most notably the Meadows Concert, which, while it might have been fun for spectators, created quite a problem for the Queens Ballpark Company, which is the company that owns Citi Field; and my hunch is the Meadows will be canned or re-located after this upcoming year. Simply put, Metropolitan Hospitality does everything, from a birthday party to a lacrosse tournament, which, while un-conventional for a baseball stadium, is better than having the stadium stay closed all winter. So, we’ve touched on all the elements of Citi Field. Most everything is positive, and all of the negatives have been rectified, but here’s the interesting thing. I personally wish Citi Field wasn’t built. I know, I know, that’s crazy, but I’ll explain. Citi Field is infamous for being funded with $615 Million Dollars in Public Subsidies, and is privately owned. Furthermore, New Yorkers don’t have any attachment to something that they payed for, something that is very different from a lot of privately owned stadiums. Citi Field was made without the fans input, and the owners paid for that. Attendance was very low the first few years, despite good transportation options with un-limited parking, the New York City Subway and the Long Island Rail Road. Many people were outraged by the lack of “Mets” in the ballpark, instead featuring nods to the Brooklyn Dodgers, the favorite team of Mets owner Fred Wilpon when he was a child. Additionally, many people took objection to the naming rights deal, which was given to CitiCorp for $20 million dollars per year, the first major sports team in New York to have such a deal. T-Shirts were made reading “I’m Calling It Shea!”, and were worn by popular figures, like Jonathan Lethem, during occupy Wall Street. Yes, Citi Field has grown on me, and has grown on many other fans, and I do realize that some children, teenagers and even adults need alternate forms of entertainment during a baseball game, citing the game is too slow, but there was something nice about Shea Stadium, a classic ballpark and a real marvel of it’s time. It was no beauty, but with a renovation, I think it could have been a better solution. At the end of the day, however, Citi Field is a beautiful ballpark, and, you don’t even have to like baseball to attend a game, but wether or not that’s a good thing is something that has been bothering me ever since I walked into Citi Field for the first time in April of 2009. Unfortunately for me, owners have a different question nowadays: Wether or not an amenity is profitable. One of the key additions to the Mets this season was the signing of credible shortstop Asdrubal Cabrera, however, he is the victim of the first injury of the Spring. According to the New York Times, will visit with the Mets’ medical staff and get an injection of platelet-rich plasma to speed healing, General Manager Sandy Alderson said. Cabrera, who agreed to a two-year, $18.75 million contract in the off-season, said he might get a second magnetic resonance imaging test. Cabrera got injured in yesterday’s Cardinals vs Mets exhibition game, as he was diagnosed with a strained patellar tendon in his left knee after running the bases. He is expected to “remain idle” for two weeks and is questionable for Opening Day.